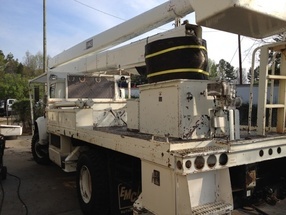 Restoration Service for Cars, commercial Trucks, Equipment And More. 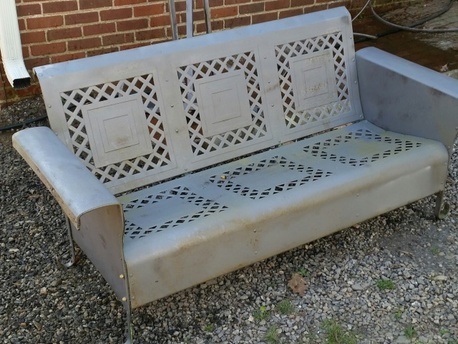 Restoring antiques, revitalizing lawn furniture, making statues look more statuesque, making monuments look more monumental, and making old things look new. The unsalvageable can be salvaged, and things that seem too far gone to bother with can be made to look new. 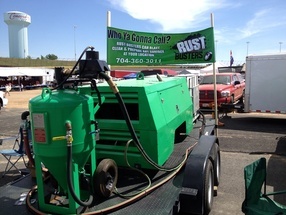 Our machine is tough on rust, paints, grease, mold, and other weather build ups. This process, however, is gentle enough to keep steel, aluminum, stone, concrete, marble, and cement surfaces looking like new. All types of rust, paint, and powder coating from most equipment and machinery. Photo shows water vapors, not dust. Rust and paint removal for auto restorations. Mobile Surface Restoration Preparation service provided to Charlotte NC, Mint Hill, Matthews, Monroe, Indian Trail, Harrisburg, Lake Norman, Gastonia, Concord, Hickory, Statesville, Winston Salem, Greensboro NC, Boone, Blowing Rock NC, Spartanburg SC, Greenville SC, plus other areas in NC & SC.